Stretched along the left bank of the Seine at the edge of Saint Germain des Prés, and just a stone throw away from the Pont Neuf and Notre Dame, the Quai des Grands Augustins has been the domain of “les bouquinistes” for over four centuries. The Pont Neuf and the Ile de la Cité. As soon as the Pont Neuf, the then new bridge that is now the oldest remaining one in Paris, was inaugurated in 1609, people flocked there, drawn by the spectacle of its lively stew of street vendors, performers, quacks and charlatans of all stripes. Before long, it had also become a favorite of second-hand book peddlers, who doubtless found this medieval version of the shopping mall a convenient alternative to itinerant markets. Over time these bouquinistes, as they were called, spread out along the banks of the river. They are still here today, with their traditional green box stalls overflowing with used and antiquarian books, vintage magazines, posters and postcards. Les Bouquinistes, Guy Savoy style. But my favorite place to linger on the Quai is not a bookstall but rather the habit-forming “avec Guy Savoy” bistro across the street, Les Bouquinistes, named as an accolade to this historic Paris institution. Widely recognized as one of the greats chefs of his generation, Guy Savoy is known for his nuanced adaptations of the grand French culinary classics. In addition to his eponymous luxury-dining shrine, he is the owner of five bistros around Paris, including Les Bouquinistes. Here, he takes an active part in the development of the overall menus and individual dishes while entrusting their execution and the management of the kitchen to talented young chef Stéphane Perraud. Gazpacho with cucumber sorbet and Burrata cheese. My most recent meal here begins with a sumptuous gazpacho where all the flavors of garden fresh summer vegetable and herbs are further enhanced by generous dollops of cucumber sorbet and perfectly aged, creamy Burrata cheese. My dining companion also opts for a soup starter, a foamy emulsion of velvet crab bouillabaisse garnished with crab ravioli. I can’t resist claiming of spoonful of it. The frothy liquid is a subtle burst of complex ocean flavors blended with lemon grass and a touch of ginger, a perfect foil for the generous crabmeat ravioli. Roasted loin of lamb en croute. My entrée is a luscious carré d’agneau en croute, a lovely medium rare loin of lamb wrapped in golden, flaky puff pastry and served with grenaille (roasted new baby potatoes) and braised eggplant. My friend’s braised breast of suckling pig is set on a bed of haricots de Paimpol (delicate fresh white beans from Brittany) and topped with a golden pulled pork dumpling. Predictably, I zero in on the All Things Chocolate dessert – a sinful medley of chocolate mousse, butter cream and a light flourless cake wrapped in ganache. Meanwhile, my friend declares herself delighted with her pyramid of profiteroles on a bed of red fruit compote. For our wine selection, we follow the sommelier’s advice and opt for an interesting red Côtes du Rhone (2013 Le Temps Est Venu) from Domaine Ogier d’Ampuis, which beautifully enhances both our menu choices. Interior design by Jean-Michel Wilmotte. Les Bouquinites, lesbouquinistes.com, 53 Quai des Grands Augustins, 75006, Paris, is open every day for lunch from 12:00 pm to 2:30 pm and for dinner from 7:00 pm to 11:00 pm. Advanced reservations are usually necessary. Contact: Email bouquinistes@guysavoy.com, Tel: +33 (0) 1 43 25 45 94. In addition to its a-la-carte menu (average € 75 per person excluding beverages), Les Bouquinistes offers a six-course tasting menu (€ 89). At lunch, there are also daily two and three-course set menus ranging from € 32 to € 45 that include one glass of wine. Nearest Metro stations are Odeon or Saint Michel. Both are within a five-minute walk. Guy Savoy’s brilliant career began with his apprenticeship with the legendary Frères Troisgros in Roanne, in the Loire Valley. He went on to hone his skills at Lasserre in Paris and the Lion d’Or in Cologny, Switzerland, before becoming Head Chef of Claude Verger’s La Barrière de Clichy. He then opened his own restaurant in 1980 at the age of 27 and earned his first Michelin star the following year, followed by a second one in 1985. A third star followed some years later. In addition to his signature restaurants in Paris, Las Vegas and Singapore, he also own five bistros around Paris, each with a different culinary focus. My recent short visit to Metz, the capital of the Lorraine region in the northeastern-most corner of France, was ostensibly not about food. It was supposed to be all about the top-notch museums that show and tell of two millennia of rich local history from the Gallo-Roman era to modern and contemporary art. But trouping around medieval cobblestone streets and futuristic museums is hungry work. Luckily I was able to time my wanderings just right to happen by the Marché Couvert around lunchtime. And it turns out, in addition to its rich displays of glorious foodstuff it has a most interesting architecture and history, for a covered market, that is. The Metz covered market started out as a palace. One of the oldest and grandest in France, it was originally commissioned in 1762 from the Royal Architect by the Bishop of Metz as his new palace. Work began in 1785. But before the owner had a chance to move in, the 1789 French Revolution happened. Anyone of nobility, bishop included was well advised to lie low. Rather than let a good palace go to waste, the people of Metz decided to repurpose it into their central food hall. And here you have it, a 5,000 square meter (54,000 square foot) U-shaped neo-Classical covered market built of the local golden Jaumont limestone, adjacent to the forecourt of the Metz Cathedral. Go up the stately staircase and walk in. 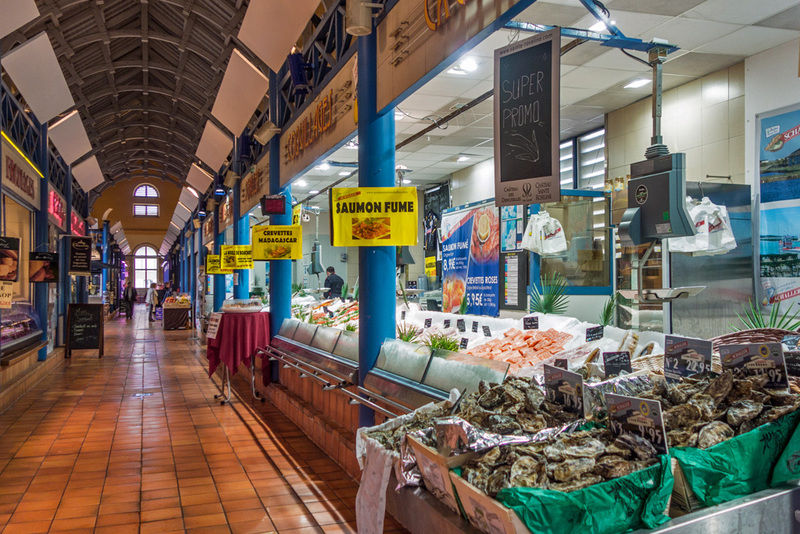 Over 40 cheese mongers, butchers, greengrocers and every possible local specialty awaits along with a central food court. And that’s where I come upon Soupes a Soup’s, a soup bar with at least half a dozen kinds of thick, flavorful soupes-du-jour. The man behind the soup pots is Patrick Grumberg. With his red knitted hat and spectacular white facial hair, he looks like an understudy for Santa Claus. 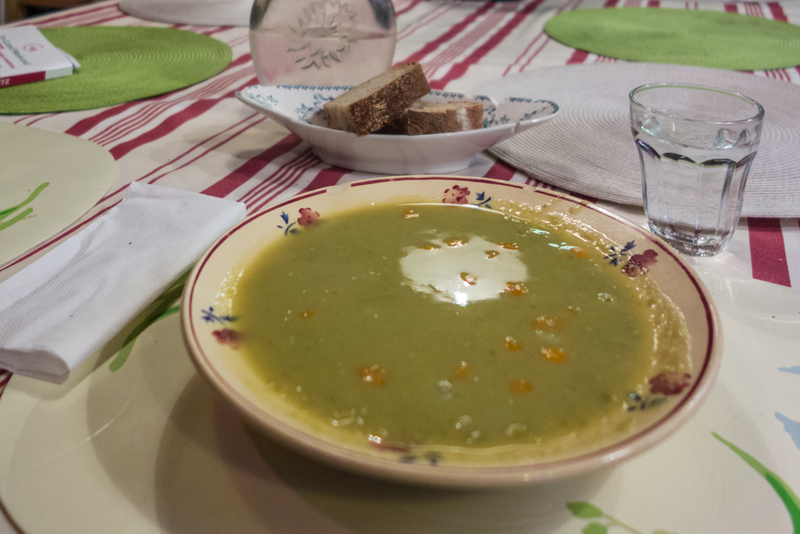 Order your soup to take out or sit on a bench around the family-style table and eat in. I opt for the latter. My order arrives instantly, in an old French china plate slightly chipped for added character and filled with thick, piping hot split pea soup and a hunk of crusty country bread. It’s so filling I can’t even be tempted by the home-baked cake on offer for dessert. Another welcoming place to drop into any time of day when a serious hunger pang strikes is En Robe des Champs (French for in their jacket). This is not a fashion statement but the name of a classic French brasserie, at least in appearance. 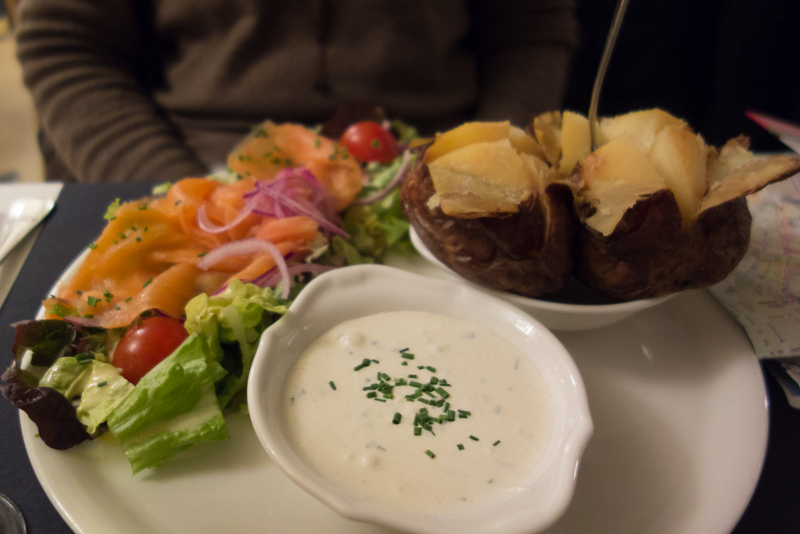 Open the menu, which is served all day, and it’s all about potatoes, baked, au gratin, mashed, prepared with a wide assortment of toppings and served with interesting salads. 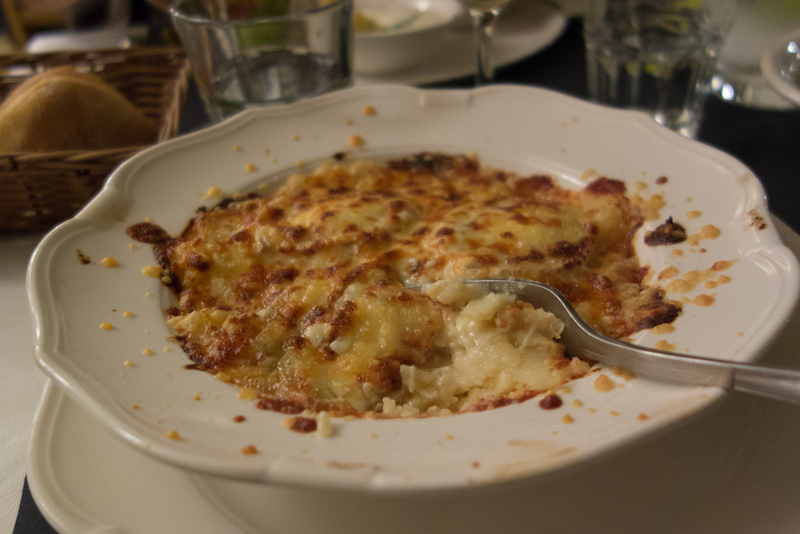 I have the gratin dauphinois. With its soft, cheesy interior and perfect brown top crust, it is one of the best I’ve ever had. Meanwhile my friend enjoys a baked potato with smoked salmon. Everything is locally grown, well prepared, served promptly by the friendly staff, and hugely satisfying with a glass of crisp local Moselle wine. The bar at La Brasserie. It is on the last morning of my stay in Metz that I hear of Les Amis de Saint Louis (Friends of St. Louis), on the grounds of the Catholic Seminary of Metz. Originally intended to feed the seminarians, the restaurant morphed over time into a fine dining establishment, currently under the direction of up-and-coming young chef Christophe Koessler. It is open mainly for lunch. Ever the optimist, I drop by on impulse and can only glimpse covetously at the sumptuous dining room with its ornate eighteenth-century wood paneling and antique crystal chandeliers. Every single one of the white linen-clad tables is occupied by lucky diners enjoying the refined seasonal menu. The apologetic hostess suggests that I try La Brasserie across the hall, where there may still be room. There is. The menu is casual fare but the high standards of the chef come through regardless. While not what I had hoped for, I do enjoy a delicious salmon burger on toasted brioche served with a basket of perfect French fries and a lovely chocolate tart dessert. Note to self: next time reserve as soon as I’ve purchased my train ticket to Metz. Soupes a Soup’s, soupesasoups.com is open Tuesday through Thusday from 10:00 A.M. to 6:30 P.M. and Friday and Saturday from 8:00 A.M. to 7:00 P.M. Contact: Email patrick@orange.fr .Tel: 33 (0) 6 08 31 11 04. 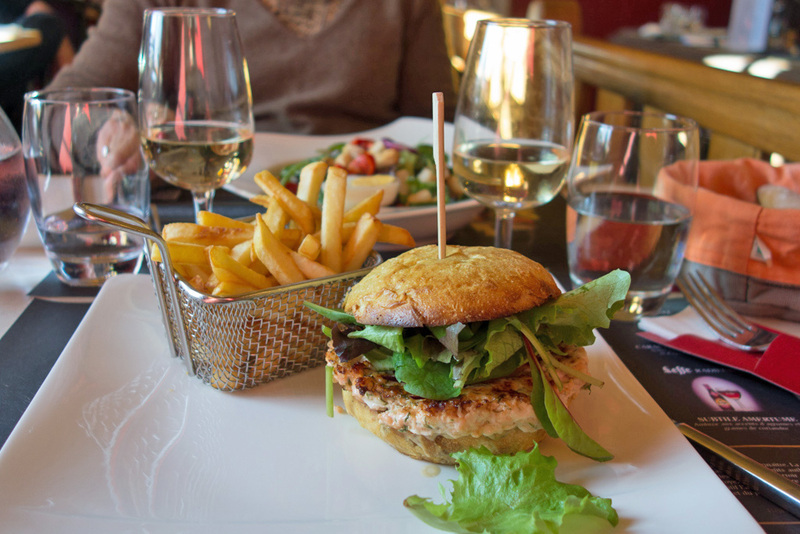 Les Amis de Saint Louis and adjoining Brasserie, lesamisdesaintlouis.fr, are located at 4 Avenue Jean XXIII, Metz, France and open every day 12:00 P.M. to 3:00 P.M. as well as on Friday and Saturday nights from 7:30 P.M. to 9:30 P.M. Contact: Email lesamisdesaintlouis@eveche-metz.fr , Tel: +33 (0) 3 87 75 51 71. The Parisian bistro in its original incarnation as a small neighborhood eatery serving simple home-cooked meals traces back to the industrial revolution. From the mid-1800s, rail transport unleashed a flow of migrants from the rural areas attracted by employment in the new industries around the capital. Many settled in boarding houses that provided meals as well as rooms. Industrious landlords started supplementing their incomes by opening their kitchens to paying nearby residents. In time, the food service moved from these basement kitchens to unassuming storefronts. Today their ubiquitous presence throughout the city makes them difficult to differentiate at first glance. The quality of their offerings can vary wildly, from just another meal to a memorable dining experience. La Regalade never fails to deliver the latter. 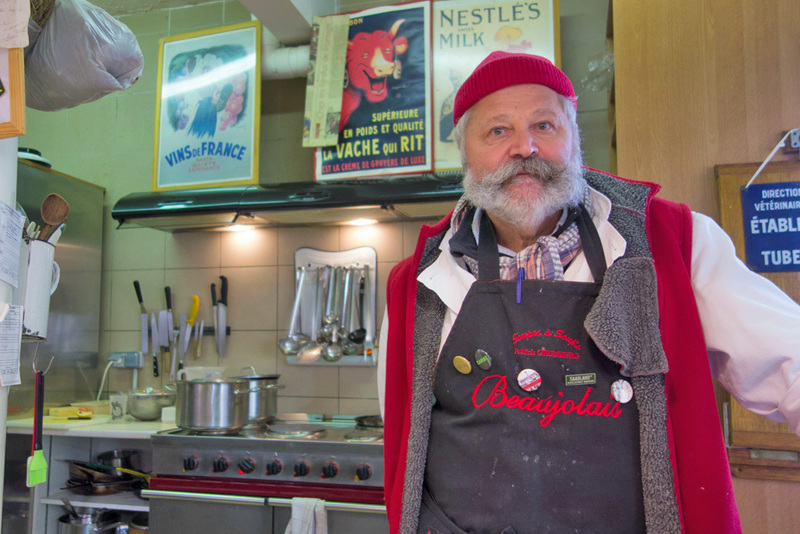 Located near the Porte d’Orléans in a middle-class neighborhood at the southern edge the city, it has been the domain of Bruno Doucet since 2004. Here this talented chef, steeped in the grand classic tradition, dishes out a cuisine that has become so popular over the past two decades that a name had to be invented for it: Bistronomy. It is where gastronomy and the skills Doucet honed at the side of the likes of Gabriel Biscay at Prunier’s, Pierre Gagnaire at his eponymous Pierre Gagnaire Restaurant and Jean-Pierre Vigato at Apicus, take bistro fare to new heights. 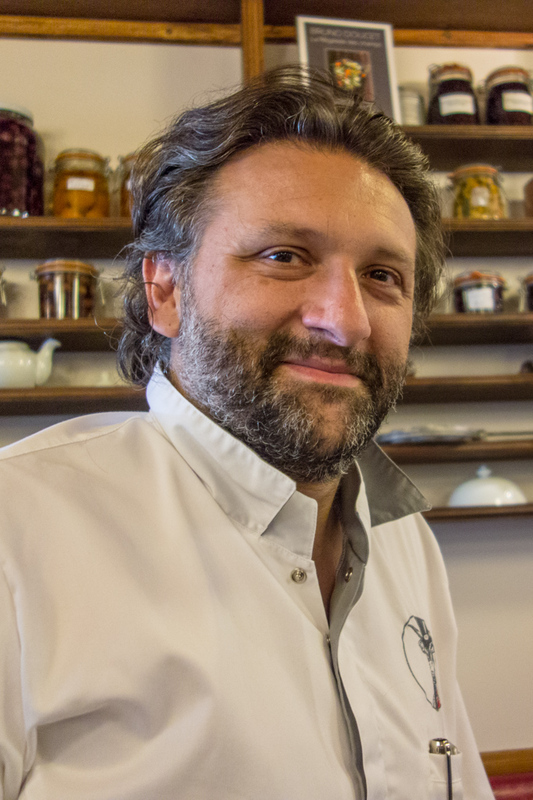 His blackboard menu of unpretentious, flawlessly prepared dishes is offered at a friendly three-course prix fixe of € 37.50 at lunch and dinner. It is seasonally adapted and includes a few selections of the moment at a small additional cost. The service is attentive and convivial. The wine list is well rounded, with interesting and fairly priced selections from all the major growing regions of France. The décor is timeless, quintessential bistro, with a long zinc-top bar Hemingway would have enjoyed. The retro tiled floor harks back to the same era. Small square oak tables are lined along burgundy leather banquettes and open shelves filled with food jars and copper cooking accessories hang from the plastered wall. The signature Paté de Campagne is served as amuse-bouche. 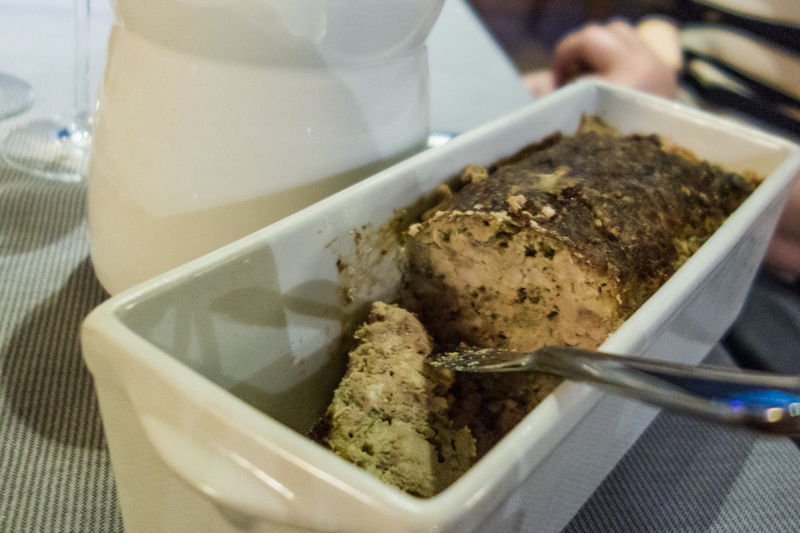 All of that becomes irrelevant the instant the welcome white china terrine of the signature house paté de campagne materializes on our table with its usual sidekicks of earthy country bread and tiny cornichons. I could make a meal of it but previous visits at La Regalade have taught me moderation. There are three scrumptious courses to come and portions are usually generous. Maki of tourteau crab with cucumber. 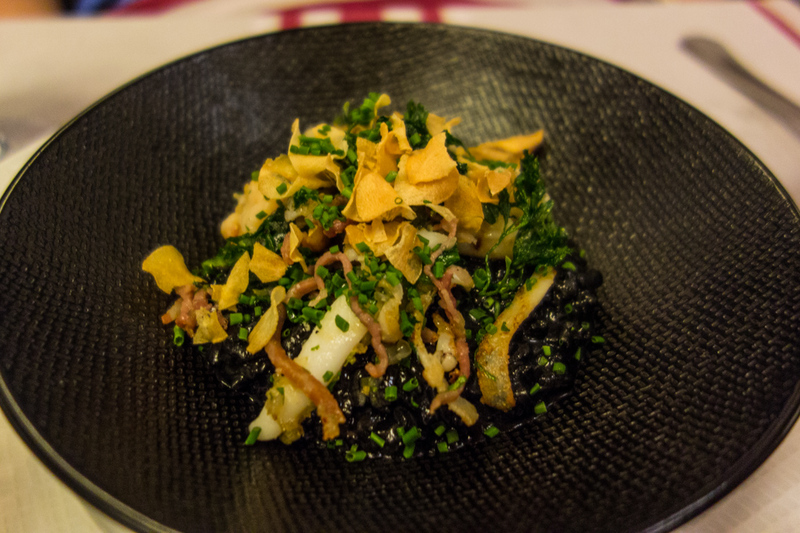 Creamy squid ink risotto is a house favorite. 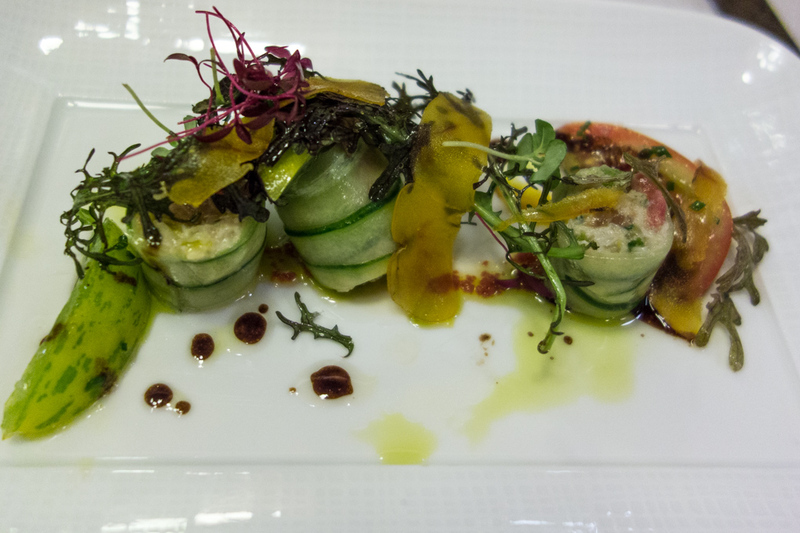 On this recent visit I start with an imaginative maki of tourteau crab wrapped in shavings of marinated cucumber served with summer greens and drizzled with a warm vinaigrette. My main course is veal, thick tender slices of it roasted to pink perfection and topped with an unusual croquette of pulled veal, served in a cast iron casserole, with baby vegetables braised in a reduction of Banyuls wine vinegar. My companion enjoys an appetizer of creamy squid ink risotto topped with sautéed calamari, followed by caramelized pork breast, so succulent with its crunchy exterior that I make a note to order it next time I see it on the menu. 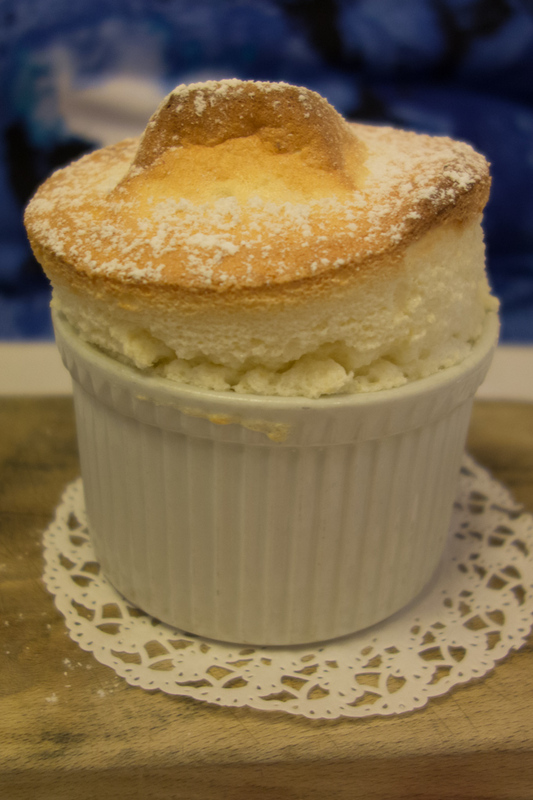 Her dessert is the exquisite Grand Marnier soufflé served at the height of its perfection. As for me, although I know I will be able to manage only a few spoonfuls I indulge in my all time La Regalade favorite, the Riz au Lait Grand Mère. The delectable creamy rice pudding speckled with vanilla bean is served in a china crock large enough to share, accompanied by a pitcher of orgasmic hot butterscotch with sea-salt. This is the ultimate comfort food of generations of French children and, with apology to my own Granny, the best I ever tasted. Our wine selection is a lovely bottle of light red Saumur from the Loire Valley, 2011 Chateau du Hurean. I am not surprised in the middle of our meal to see Doucet emerge briefly from the kitchen, a working chef in the heat of the midday crush. He is a hands-on chef whose talent and enthusiasm shine through every dish. Paris gourmets and gourmands love it. When he appears again at this end of the service, he graciously takes time to share his thoughts on his continued success. “I believe in steering clear of elaborate cuisine,” he states. “I focus on the best seasonal products from the French heartland, turn them into simple, rigorously prepared dishes and allow the honest food to take center stage.” A command performance that calls for encores. 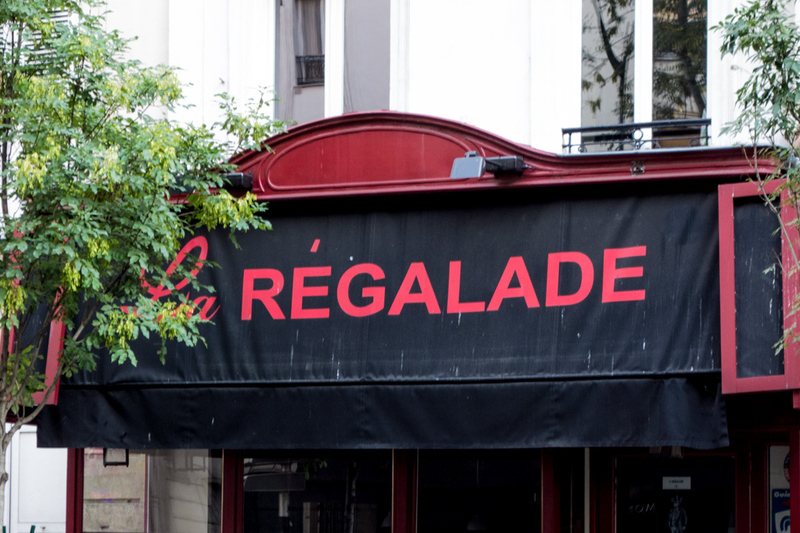 La Régalade, at its flagship address 49 Avenue Jean Moulin, 75014. Tel: +33 1 45 45 68 48, is opened Monday through Friday for dinner from 7:30 to 11:00 pm and Tuesday through Friday for lunch from 11:30 am to 2:30 pm. It can seat up to 55 and usually is a tight fit. Reservations are necessary, at least one week ahead for dinner, and a couple of days for lunch. Two additional addresses have opened in recent years in different parts of the city. La Régalade – Saint Honoré, near the Louvre in the 1st Arrondissement, and La Régalade – Conservatoire, wedged between Les Grands Boulevards and Montmartre in the 9th Arrondissement. Opening days may vary there but reservations remain necessary.